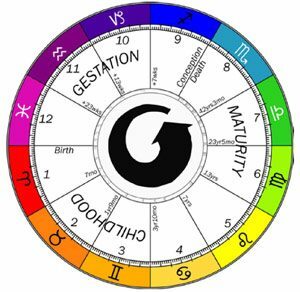 Workshop, Saturday Apr 21, 1-5 p.m.
Our astrological life in time is lived through a symbolic cylinder beginning at conception. As we age, the cylinder fills up with memories and experiences. Planets register at certain levels of the cylinder and aspects connect them through the timeless centre of the horoscope. The movements of the planets spiraling through the cylinder makes a pattern similar to that of the DNA molecule. Each planet and angle in your chart signals a time in history when that quality in you originated in the historical process. Like Jung’s Collective Unconscious, we carry the historical process within our very genes, awaiting its activation through study, travel, residence, fantasy and our life activities. Learn how to track your life history through time in this workshop with A.T. MANN. A.T. (“Tad”) Mann developed Life Time Astrology to integrate DNA and the spiral solar system moving through the houses as our time sense contracts as we age integrating with genetics and physics. The Round Art (1979) introduced original ideas about conception and gestation, as well as process-oriented astrological prediction techniques. He applied these techniques to healing, reincarnation and the Mandala Astrological Tarot. He received a five-year B.Arch. degree from Cornell University and worked as an award-winning architectural designer for major firms in New York City and Rome, Italy. He lived in England and Denmark for 26 years and now lives in Hudson, NY. His 14 books cover a very wide range of subjects and have been translated into 20 languages. In the 1970s he created a series of yearly calendar books called The Phenomenon Book of Calendars that were published worldwide. The first book he wrote and illustrated was The Round Art: The Astrology of Time and Space published in 1979. He followed with Life Time Astrology (1984), Astrology and The Art of Healing (1989), The Future of Astrology (1988), Millennium Prophecies (1991) and finally A New Vision of Astrology (2003). 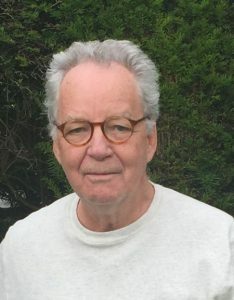 Sterling published his book Sacred Landscapes with photographs by Lynn Davis, and also his Mandala Astrological Tarot in 2009. For more information visit his website at atmann.net. A.T. will be available for readings Thursday, April 19 or Friday, April 20, in Oakland. Contact him directly at atmann@atmann.net for further details and to book your session. Register here for the Workshop April 21, 1-5PM, Fort Mason C-210. Don’t miss this rare visit with A.T. Mann. For details on how to become an NCGR Member and the benefits of joining our chapter visit our Membership page. Or if you’re ready to sign up now and receive benefits, go to the Geocosmic shopping cart.